Tigran is a four-time Russian national champion. Tigran has been fencing since the age of 7. Winner of the European Championship (1981) in the team competition and several other international tournaments, he earned a place on the Soviet Union's Goodwill Games Pentathlon Team in 1984, proving him to be a top athlete in fencing, shooting, horse riding, running and swimming. 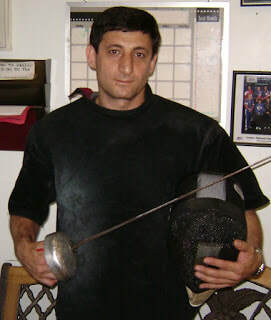 Tigran founded SWORDS in 1997. With over 40 years of competing and coaching experience, his students have competed on the USA Fencing Cadet, Junior and Veteran World Cup teams, taken Gold at the Junior Olympics, and earned many national titles. His students consistently rank in the top eight in the nation in Division 1, Junior, Cadet, and Y14. Tigran's students have gone on to fence at Stanford, MIT, Princeton, Columbia, Notre Dame, and the Air Force Academy, to name a few. Shown here with Mia Wu after taking Bronze in Cadet at Junior Olympics, 2019. Luis Dealba Yount grew up at the Swords Fencing Studio. Tigran Shaginian has been his coach and mentor for many years and Luis is delighted to be able to pass down the training and work with Swords fencers. Luis has over 12 years combined of fencing and coaching experience and has medaled in National Championships and the Junior Olympics. He loves coaching strip side, and has coached many Swords students to National Championship medals. A three-time Junior Olympian and a PCC semi-finalist, Jason has won numerous medals at Senior divisional and sectional tournaments from Southern California to Northern Ohio. He has coached Junior Olympians in the Cadet and Junior age-groups, and the 2010 Senior Women’s Pacific Coast Champion. Jason was head epee coach at UCLA for a number of years, where his students achieved individual and team medals in intercollegiate NCAA competition. Our coaches and our students strive to train harder and be better. We are always learning and growing together. One of the purposes of this is to help our younger students get into and attend the top universities in the country, once they are ready of course. Fencing is not the only way but is one of the ways to attend some of the best Ivy, private, and public institutions in the nation. We are an Epee only club as we believe that focusing on one discipline helps to strengthen our club and fencers. Our fencers have or are currently attending: Harvard, MIT, Columbia, Notre Dame, Stanford, Barnard, Penn State, Ohio State, St. John's, UC Berkeley, and UCSD. They have also been accepted to : Princeton, Yale, Brown, McGill, UCLA, Pepperdine, UC Irvine, and many others.